In our last episode, we finished up with C pointers (whew!) and we built a chaser light marquee frame using the Simple Chaser Lights kit available from Nuts & Volts. Now it's time to study a C topic related to pointers: arrays. As a reward for our patience with the theory, we will build another project using the chaser lights kit: a POV (Persistence Of Vision) wand. As before, this Workshop is split between some C theory and a tangentially related (but more fun) lab exercise that uses LEDs. We are nearing the end of the C theory, and soon will just use it and refer back to these articles when we show the C code. So, save your back issues! They might come in handy some day when you need a refresher on some arcane C concept. 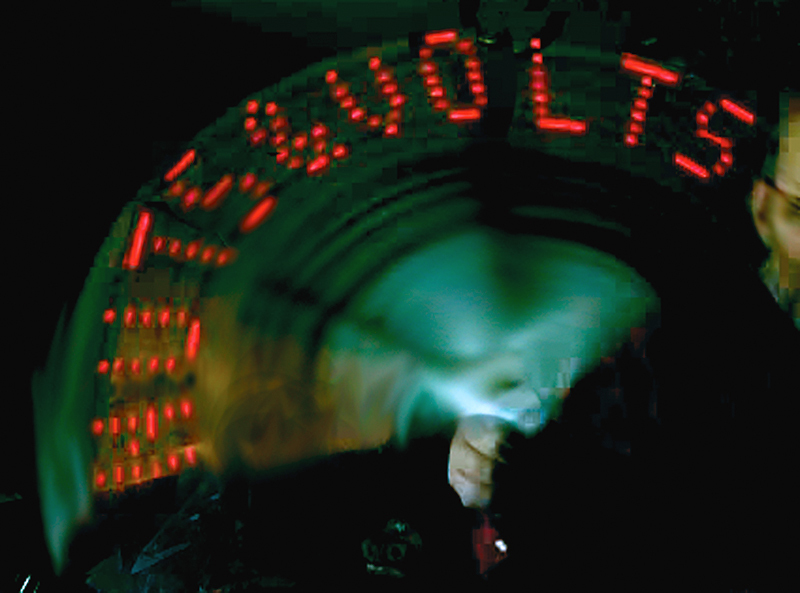 Figure 1 shows the chaser lights board tied down on a stick and swung madly about in a dark room where you can just see NUTS & VOLTS spelled out in the air. FIGURE 1. Slinging the simple chaser lights board. In this episode's lab section, we will look at some of the principles behind the phenomenon of POV and will build the actual thing in the next. Last time, you probably got good and sick of hearing about pointers. I hope that you also got how they work, because they are critical to serious use of the C programming language. After all that, we are now going to look at arrays that do many of the same things you’d do with pointers, but are a lot easier to understand. You might wonder why we didn’t look at arrays first if they are easier. The reason is that you’d tend to skim over pointers if you learned arrays first. You’d think, ‘Oh I can do that with arrays, no need to learn pointers!’ Well, not exactly. Pointers and arrays are very closely related but not identical, and you will run into pointers a lot in C, so best learn them now rather than when your boss is standing over you with a whip. An array is a C data type that represents a sequence of memory locations. Think about that for a moment. Memory is where data is located and each of these locations has an address beginning at 0 and increasing all the way to the end of memory (okay, there are exceptions but they are not relevant here). When you create an array of size x, C will assign x contiguous locations in memory to that array. Say, for instance, you create ‘char myArray’ — the C compilation process will find 10 contiguous locations in memory that are not in use. It will then assign the address of the first location to the 0 element of the array. we are storing the ASCII code value for ‘1’ which is the decimal number 49 at the memory location for myArray. Remember that  refers to the fifth memory location since we start counting at 0, so that in our example 12,717 + 5 = 12,722. This means that when you write myArray, the C compiler generates the memory address 12,722. To repeat: myArray is the data located at memory location 12,722 which is ‘l’ which is decimal 49. So, the operation shown above (myArray = ‘1’) stores an eight-bit byte with a value of 49 at the memory location 12722. One of the most useful aspects of arrays is that the address of the first element of the array can be used as a parameter to a function to tell that function where the array is located. This gives you the ability to pass the full array of 10 values to a function by sending only the address of the first location in the array as a parameter. You can see the value of this since to pass the entire array as parameters means that 10 bytes would have to be pushed on the stack using valuable RAM. Using the address of the first byte, however, you only have to pass the address which — in our case — is an integer and two bytes long. 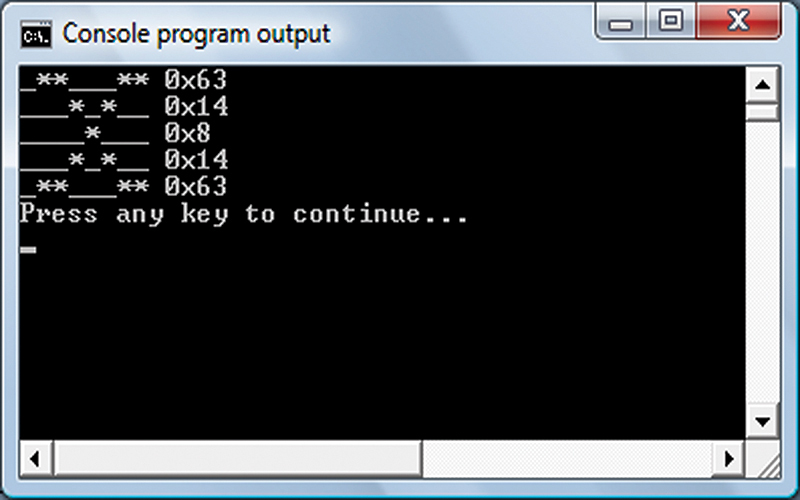 Thus, we use two bytes for the address pointer versus 10 bytes for the data. If the array was 100 bytes long or a thousand bytes long, the address for the first element in the array would still be the same two-byte size. If you want to test this with Pelles C, you can copy the font array from the font_5x7 file in avrtool box and append it to the following code, which will generate the pattern shown in Figure 2. FIGURE 2. X in console. FIGURE 3. Console pointer demo. Well, I went way too long on the C theory, so I’ll have to short-change things a bit in the lab. We’ll just look at the POV concept and delay the details on how to convert the simple chaser lights board until next time. The thaumatrope is a spinning disk toy that was popular in the 19th century. 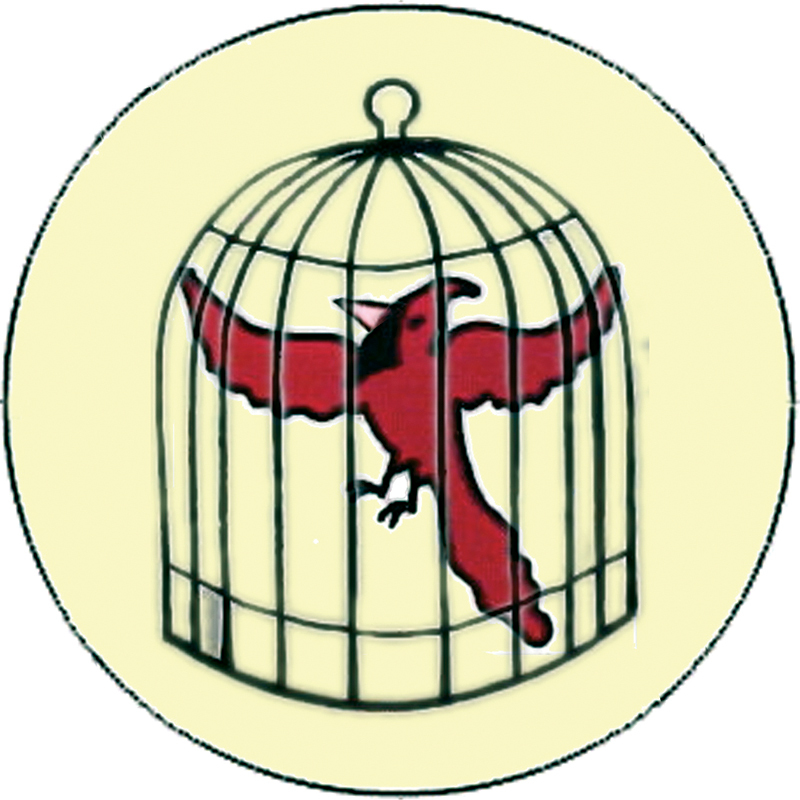 If you saw the movie Sleepy Hollow, you may remember the scene in Figure 4 where Ichabod dreams about his mother showing him a cardinal in a cage using a thaumatrope. FIGURE 4. 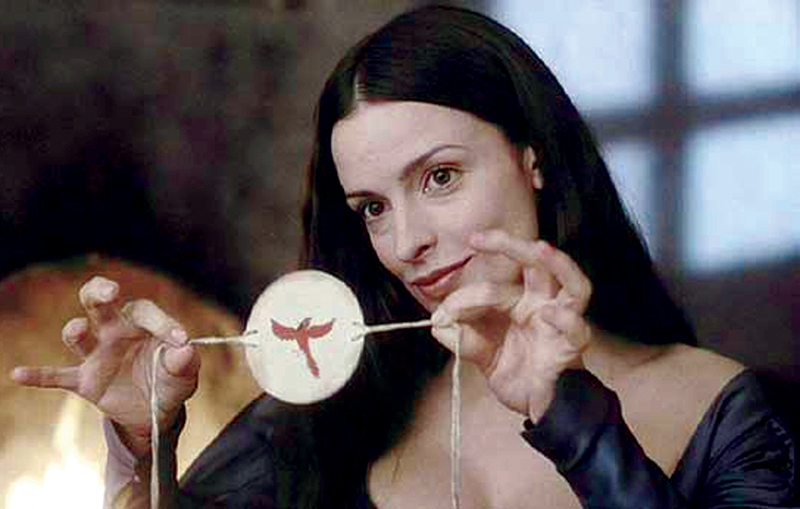 Thaumatrope from the movie Sleepy Hollow. KATRINA — You can do magic! Teach me! ICHABOD — It is no magic. It is optics. Oh, what a stick in the mud! Of course it is magic. You can build your own by copying Figure 5 and gluing it to a disk and attaching some string as shown in Figure 4. Just twirl away and impress three year olds everywhere. 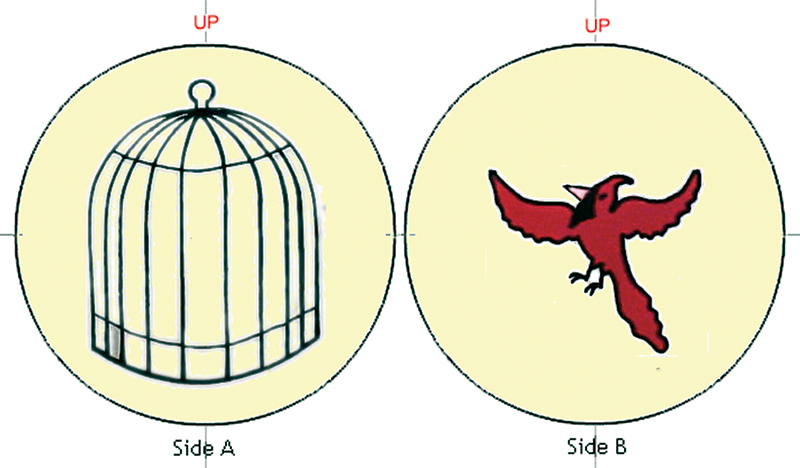 NOTE: if you build the thaumatrope, be sure and have the bird and cage upside down relative to each other when you glue them front to back so that when the disc is spun, you will see the bird upright in the cage. This little project is kind of fun to do with kids, especially when you tell them about POV and how this was seen as a sort of magic long ago. NUTS & VOLTS Out of Thin Air! FIGURE 7. Simple chaser lights board. When I attacked the problem of making an LED POV wand, it attacked back. At first, I built one of those hand waving wands that you sweep back and forth to display a message, and I quickly found that this concept doesn’t work as well as I thought. First off, if you are displaying the message to others, then you are standing behind the wand and have no way of knowing how the message looks other than to stand in front of a mirror. Doing so lets you get an idea about how fast you need to wave the wand and lets you change the waving so that the message starts at the beginning of a sweep and finishes at the end of the sweep. Having a mirror available is a bit of a stupid requirement. So, I decided that instead of all the hand waving, I’d just attach the chaser lights to a board with a handle on it and swing it in a circle. The results shown in Figure 1 are with me slinging with my right hand and trying to take a picture with my left. (It took a lot of pictures to get one that had all the text in the frame.) The slinging technique requires less finesse in your timing, though you will want to practice in front of a mirror to get an idea of how fast to swing it. Then, there is that problem that you might get the timing right, but the message will be showing at the bottom of the swing and appearing upside down. I built the device shown in Figure 1 by cutting out a two foot length of Styrofoam, fastened the chaser lights board and battery box to it with a rubber band, and then jammed a pencil in one end for a handle to swing it with. No need to show it since it looks as bad as it sounds. Nuts & Volts now carries the entire line of Smiley Micros books and kits. Some are shown in the magazine and others in the web shop. If you just can't wait and want to get a leg up on real C programming for the AVR, then get the C Programming book and Butterfly projects kit, or if you are a complete novice try The Arduino Workshop and projects kit.